Jones, from Smithfield in South Australia, was arrested at his northern Adelaide home last year after the attack, which left two men in hospital suffering from non life-threatening injuries. Police said the two men Jones attacked were both known to the Comancheros gang member. When Jones was on bail when he failed to appear on the last day of his trial in the District Court of South Australia on October 20. A jury found him guilty in his absence and he has been on the run from police since. Jones was spotted driving a lime green Ford Falcon on Yorktown Road, Craigmore in Adelaide about 1.20pm on Tuesday when he refused to stop for police. Police went in pursuit of the Ford Falcon but discontinued the chase when Jones dangerously rammed the police vehicle. A search was undertaken in the South Australian suburb of Craigmore, with the help of a police helicopter and police dogs to find Jones, but he was not found. Raymond Jones is described as Caucasian, 171cm tall, 100kg, with blonde hair and blue eyes. 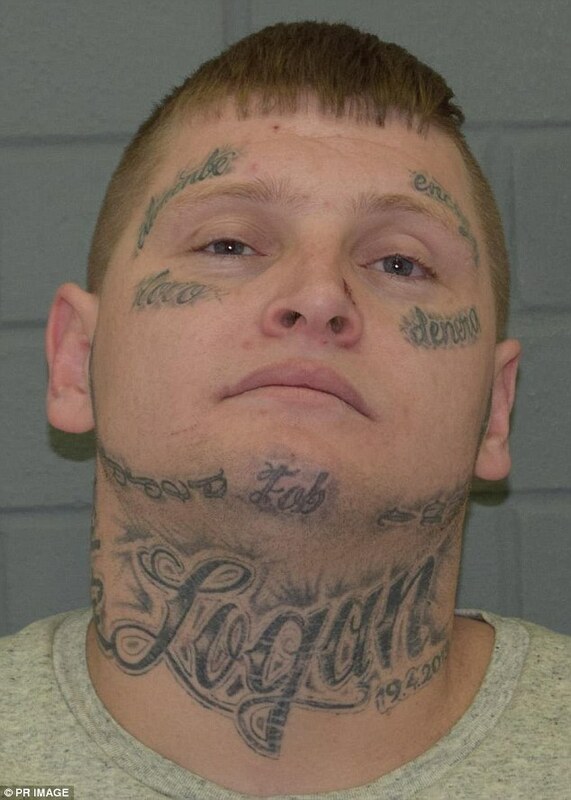 He is heavily tattooed across his face and body, including a distinctive tattoo reading ‘LOGAN’ which is etched across his neck, and words inscribed above and beneath each eye. Police warned anyone who saw Jones or knew of his whereabouts not to approach him, instead phone the police immediately.